This type of rental change is set on a per Unit-type basis, and automatically increases or decreases rental rates for a particular type of Unit depending on how full (or empty) your site is. This type of rent change ensures that overall rental income remains fairly constant, even if Customers move out and your total occupancy levels drop. During the below article you will be setting up Dynamic Rent Control. Open the Maintenance menu, then select Unit Types & Rates. 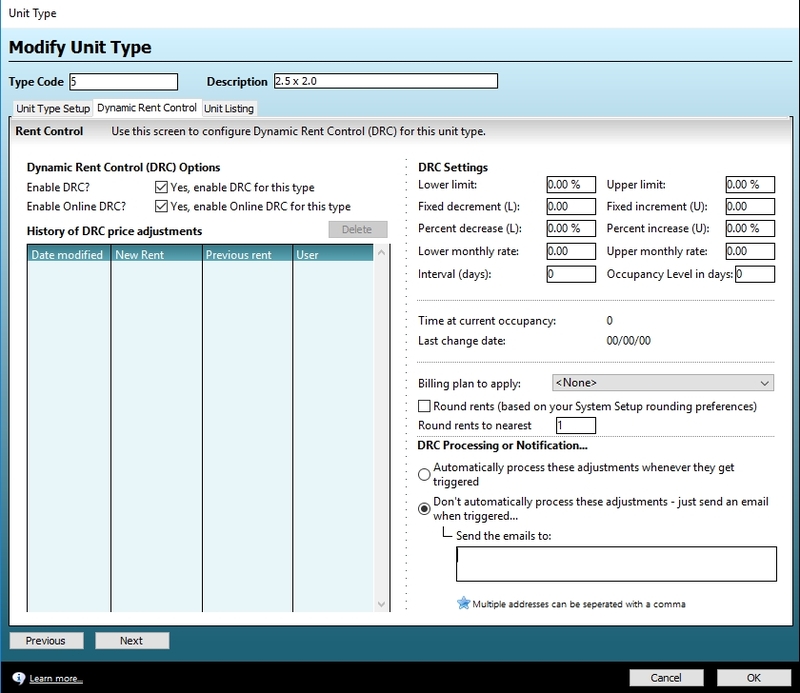 Double-click on the Unit type that you wish to set Dynamic Rent Control (DRC) options for. Navigate to Dynamic Rent Control. You will notice a table to the left hand side, showing a history of DRC adjustments for that Unit type. Click the checkbox to Enable DRC and some new settings will appear to the right hand side of the screen, as shown below. Lower limit is used to set the occupancy percentage level (for this Berth / Unit / Vault type) at which a DRC price decrease will automatically be activated. If this is set to zero, then no decrease will occur. Upper limit is used to set the occupancy percentage level (for this Berth / Unit / Vault type) at which a DRC price increase will automatically be activated. If this is set to zero, then no increase will occur. Fixed decrement (L) is used to set the fixed amount that DRC should decrease the Berth / Unit / Vault types' rate by. For example: Entering $20 here would mean that the system will automatically decrease the Berth / Unit / Vault types' monthly rental value by $20 each time DRC gets triggered. Fixed increment (U) is used to set the fixed amount that DRC should increase the Berth / Unit / Vault types' rate by. For example: Entering $20 here would mean that the system will automatically increase the Berth / Unit / Vault types' monthly rental value by $20 each time DRC gets triggered. Percentage decrease (L) is similar to above, but will decrease the amount by a percentage. you can set both a fixed and a percentage decrease if you like; Storman will automatically use the higher of the two. Percentage increase (U) is similar to above, but will increase the amount by a percentage. you can set both a fixed and a percentage increase if you like; Storman will automatically use the higher of the two. Lower monthly rate is used to tell Storman what the minimum monthly rental amount for this Berth / Unit / Vault type should be. Storman will continue to process DRC decreases using the rules you've set until this lower rate has been reached, at which time it will stop decreasing rental rates for this Berth / Unit / Vault type. Upper monthly rate is used to tell Storman what the maximum monthly rate should be. Interval (days) is used to set how long Storman should wait between two increases. For example: If your vacancy levels are changing so often that DRC is getting triggered once a week, you can stop Storman from making such frequent adjustments by setting a number in this field. This will tell Storman to wait X amount of days before it makes another DRC pricing adjustment. Occupancy Level in days is used to tell Storman how often to check whether an adjustment needs to be made. However, this would trigger if it just happened to be at the lower / upper limit for that day. Occupancy level in days means that it must have been at that level for X days. For example: If you set this to '5' then when it checks the occupancy level it will confirm how many days it has been at that level. If less than 5, Storman will not process the DRC adjustment - even if the other criteria are met. Time at current occupancy is the value that the Occupancy Level in Days checks. Last change date displays the date that the rate was last changed by the DRC system. If the Billing Plan to apply field is completed and the Billing Plan on the Berth Type / Unit Type / Vault Type is blank, then Storman switch to this Billing Plan when the upper / lower limit is reached. Additionally, the Berth Type / Unit Type / Vault Type will be marked as being on special (more on this: #UNTSPCL01). Round rents will round the resulting rent amounts, based upon your Rounding options set via Maintenance, System Setup, then the Accounting tab. The DRC Processing or Notification area has two options; you can set Storman to automatically process the DRC adjustments whenever they get triggered, or you can tell Storman not to do so - but rather to just email a series of email addresses when the DRC process would have normally been triggered (this is handy to see if it's worth setting up DRC processes at your business). Setup your DRC preferences (as explained above) and click OK then Done to save & return to the main Storman screen. Dynamic Rent Control will now automatically run each day as part of Daily Processing and any adjustments will be made as per your setup.